Info "This is your first big show! Don’t forget your cue!" Ringmaster is one of Ashley's Microgames in WarioWare: Smooth Moves. There will be three hands shaking bells in a pattern. The player will have to complete the beat when it comes to his turn by hitting his wrist with his other hand (or by simply shaking the Wii Remote). 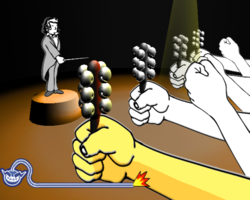 If the player doesn't do it when they're supposed to, the composer will point at them. 1st level difficulty: The beat will be a single shake. 2nd level difficulty: The beat will be two shakes. 3rd level difficulty: The beat will be three or sometimes four rapid shakes. This page was last edited on June 20, 2018, at 17:15.